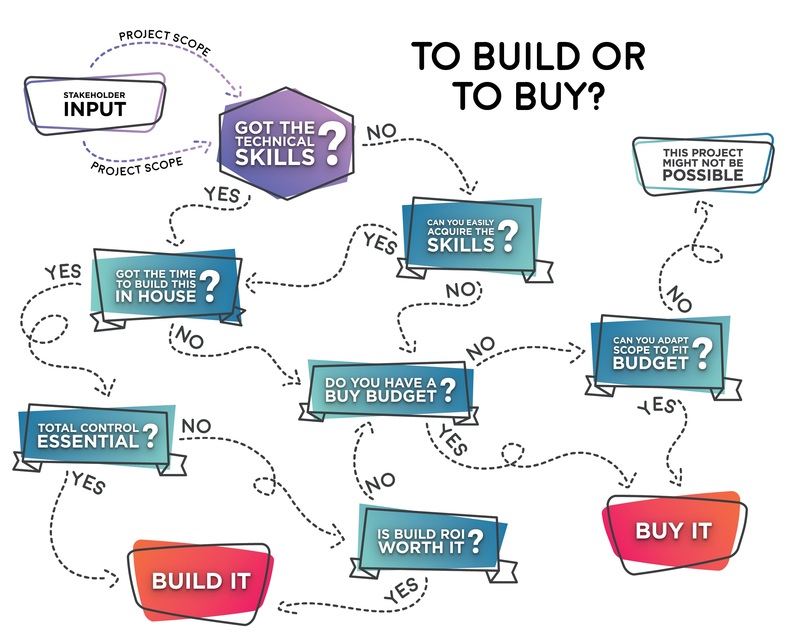 WHAT IS BUILD VS. BUY? When should museums build in-house rather than buy an existing solution? What are the questions you should ask to determine the best option? As museums grow their digital programs there is ever more emphasis on both flexibility of solutions and return on investment. A + B = BUILD. Software is built in-house and project is run in-house. C + D = BUY. Software is coded up by an external resource or bought off-the-shelf. The project is run by external resources. This is what project engagements look like at CultureConnect. C + B = ENTERPRISE. 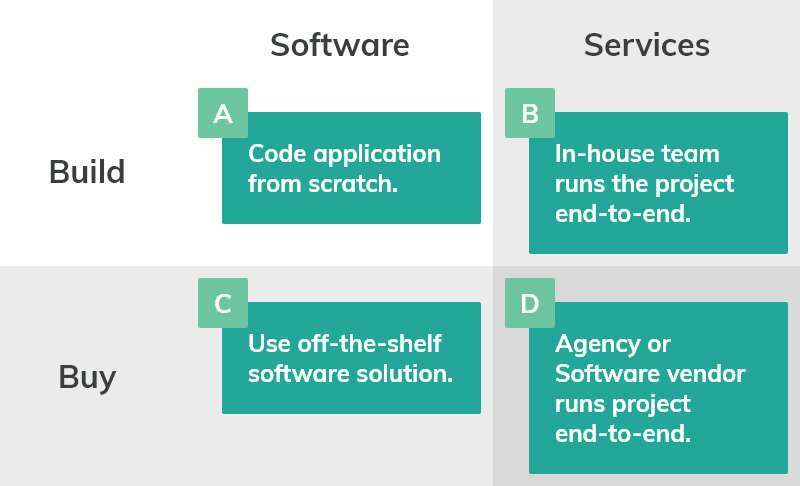 In-house teams use off-the-shelf software but run the projects internally. Read more about how we do Enterprise here. A + D = CUSTOM DEV. Applications are coded from scratch by external resources – this has been the traditional digital agency/dev shop approach. We do custom development only when we think it’s a good ROI for ourselves and our customers. The first question “Got Technical Skills?” is answered based upon the project scope. Even at the idea stage, identify the main technical skills needed to execute on the project. As the project scope is refined by stakeholder input or other research, ask the question again. If the answer is ‘no’ ask if these skills can be easily acquired (through a tutorial or hiring a dedicated resource like a freelancer). Let’s say your organization does have the in-house technical staff to execute on the project. The next critical question is ‘do you have the time?’ – maybe your team has a full dance card or other priorities. If they do have the time, the next question is about control. Is total code-level control over design, features, or functionality essential? It’s tempting to want total control, but ask yourself if it’s necessary given the project’s goals and cost in terms of staff resources and time. In other words, is the cost to build the solution in-house worth the ROI? Heather-Marie Wells, the Digital Media Project Manager at the Crystal Bridges Museum of American Art and CultureConnect CEO, Samantha Diamond presented on this question of building vs. buying during Museums and the Web 2018 in Vancouver. We not only presented the decision tree and why we settled on the questions used in the tree, but also illustrated the trade-offs by examining Digital Labels, products we built independently. Crystal Bridges built a digital label product with a certain amount of design and feature controls along with a content management system. Their team has the in-house skills and time to develop the product and enjoyed total control to allow for product iteration. That said, the ongoing maintenance of the product and extent of the feature set required continued investment. CultureConnect’s off-the-shelf Digital Labels have extensive features, flexible layout systems and design controls, and we take care of the maintenance. Our off-the-shelf solution was a great choice for an institution without a digital team like the New Orleans Museum of Art.